International Journal of Research in Health Sciences,2014,2,3,884-886. Department of DVL, Mamata Medical College & General Hospital, Khammam, Telangana state, INDIA. Intraoral malignant melanoma is an extremely rare aggressive neoplasm constituting 0.8 to 1.8% of all oral malignancies and 0.2-8% of all melanomas. Mucosal melanomas tend to present at a higher stage, are more aggressive, and in a vertical growth phase of disease. 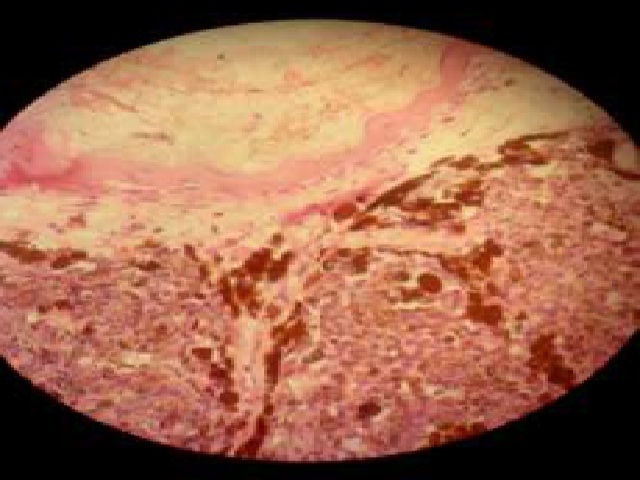 Histological examination of lesional mucosal biopsy showing intracytoplasmic melanin pigment, nuclear atypia and mitoses infiltrating through the entire thickness of biopsy confirmed the diagnosis of malignant melanoma.